Written by Elizabeth Jensen in 1998 in commemoration of the 100th celebration of ministry on the Upper West Side; updated in 2017. In the six decades since its founding in 1834 on Mulberry Street between Houston and Bleecker, the Second Wesleyan Chapel, as it was originally named, had been a somewhat itinerant congregation. After two decades on the Lower East Side, where it organized the Missionary Society Sunday School to work with underprivileged children, the Church voted to move uptown to Fourth Avenue and 22nd Street. The new white marble building, with its 210-foot spire, was dedicated on May 9, 1858, a gift from Drew University founder, Daniel Drew. Dedicated as St. Paul’s, but later dubbed the Cathedral Church of Methodism, the church could seat 1,300 people and was the scene of pre-Civil War slavery debates. The new white marble building, with its 210-foot spire, was dedicated on May 9, 1858, a gift from Drew University founder, Daniel Drew. Despite St. Paul’s stature as one of the city’s leading churches, in the 1880s some influential, younger members broke away to found the Madison Avenue Church at 60th Street. By 1882, the encroachment of businesses into the Gramercy Park neighborhood led the declining congregation to begin considering moving yet again. That decision was made in 1890, and the property was sold in 1891, after which the congregation began worshipping in temporary quarters at 20th Street and Fifth Avenue. St. Andrew’s Methodist Church, founded on the Upper West Side in 1865, had dedicated a building on West 76th between Columbus and Amsterdam. In 1890 there were discussions about merging the two churches. 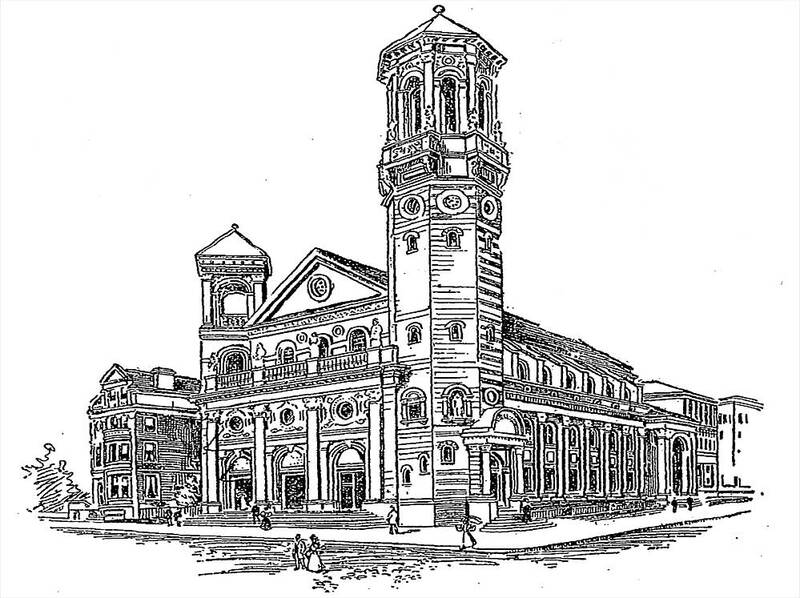 In fact, a St. Paul’s delegation made the rounds of numerous existing Methodist congregations, from the Madison Avenue Church to St. James at 116th and Lenox Avenue, in search of a merger partner. Pastor Dr. A. J. Palmer finally convinced the trustees that a location in a residential area west of Broadway offered the most potential. The original location, on the west side of West End Ave in the 100s, fell through. Land was purchased at 86th and Broadway as well, then quickly sold, when it was deemed too commercial. The site at 86th and West End Avenue was finally purchased in May 1894, despite a strong protest from neighboring St. Andrew’s. The church, in a style dubbed "scientific eclecticism," was designed by architect Robert H. Robertson and built at a cost of $343,673.52, including land. Along the way, however, as the years without a permanent church home dragged on, many parishioners left for other congregations. By the time of the October 3, 1897 dedication, St. Paul’s had dwindled to just 67 members. A long period of rebuilding began, with periods of prosperity alternating with declines. St. Paul’s membership grew with a jump in December of 1937, when St. Andrew’s, whose membership had dwindled, merged with it to become the Church of St. Paul & St. Andrew. The newly merged church enjoyed an illustrious reputation in the 1920s and 30s. The church services became known for their paid vocal quartet, which at one point included famed Metropolitan Opera soprano Eleanor Steber. In 1947, an article in The New York Timesdocumented that 150 young people attended a meeting of the Church’s 20-30 Club. But by the 1960s, the flight of families to the suburbs began to decimate the Church’s membership. Unlike its early years in the last century, when confronted with a changing neighborhood, St. Paul & St. Andrew stayed put. Indeed, the members in the 1960s and 1970s initiated many social outreach projects that closely tied the church to the community even today, most notably the West Side Campaign Against Hunger. St. Paul & St. Andrew developed close ties to neighbor Congregation Rodeph Sholom. A Spanish-language ministry began in 1963. Indeed, the members in the 1960s and 1970s initiated many social outreach projects that closely tied the church to the community even today, most notably the West Side Campaign Against Hunger. With a changing membership and increasing demands for space, St. Paul & St. Andrew began to reconsider its aging building. Over the years, the physical structure had changed many times: the stained glass window, "Paul Before Agrippa," was unveiled in 1903, the sanctuary was remodeled in 1917, and then redesigned extensively in 1938 in honor of the 1937 merger with St. Andrew’s. Many design changes corresponded to the evolving relationship between pastor and parishioners. In 1937, the sanctuary’s original platform with central pulpit and a raised gallery for organ and choir were removed, replaced by a central altar, with the pulpit and lectern in the sides and choir stalls behind. That year, the organ was installed, as well. Later, front pews were removed and by the late 1980s, sermons were preached from in front of the chancel rail, to bring the word closer to the people. Meanwhile, the ministry went on. Worship attendance tripled in ten years. The Sunday school grew from one child to fifty children. In late 1990, St. Paul & St. Andrew began talking with Congregation B’nai Jeshurun, on West 88th Street, about joining programming; after B’nai Jeshurun’s roof fell in, the two congregations began sharing St. Paul & St. Andrew’s sanctuary, starting in August 1991 through today. In recent years, the church has also shared space at various times with the Ethiopian Evangelical Church, Iglesia Cristo Vivo, Rivers of Living Water and Broadway United Church of Christ, among others. These relationships have enriched St. Paul & St. Andrew both spiritually and architecturally, as the banner that now greets all who worship in the sanctuary says: "How good it is when brothers and sisters dwell together in harmony."